There was nothing grander than a Russian Imperial coronation, and great festivities had been planned to accompany the accession of Tsar Nicolas II on May 13 1896. To ensure that the population appeared suitably ecstatic, Muscovites would be encouraged to celebrate with the help of coronation gifts from their new absolute monarch. The appointed day was May 18. Bars and booths for distributing gifts were erected in a town square in northwest Moscow, at the beginning of present-day Leningrad Prospect. This had been chosen because it adjoined Khodynka Field, a large open space capable of accommodating the large number of people who were expected to attend. The plan was an unqualified success, for a vast crowd (later estimated to have contained up to 500,000 people) gathered on Khodynka Field by dawn, in anticipation of receiving their gifts – a commemorative mug, bread roll, slice of sausage and piece of gingerbread. There would also be free beer. A large force of police was present to maintain order, but the 1,800 officers proved entirely ineffectual in the face of unfolding events. Suddenly, a rumor started that there was insufficient beer for everyone and not enough gifts to go round. The consequences were catastrophic. The crowd pressed forward, creating a disastrous crush. 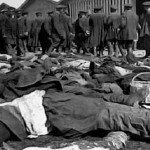 Panic swept through the assembled masses, and in the ensuing rush to escape more than 1,300 were trampled to death, with a similar number injured. The triumph Tsar Nicholas had anticipated ended in tragedy. He was genuinely distressed and spent the day visiting hospitalized victims with his wife, Alexandra. But he allowed his own better judgement to be overruled by diplomatic advisers and attended a celebration ball at the French embassy that same evening, a decision that didn’t go down well with the shocked Russian public. Death toll: 1,389 people were kitted and over 1,300 injured. You should know: The event that sparked the Khodynka tragedy – the coronation of a Russian emperor – would never be repeated. Nicholas II was the last tsar to rule, abdicating in 1917 before being executed with his family by Bolsheviks at Yekaterinburg in 1918. Opponents nicknamed him ‘Nicholas the Bloody’ as a result of Khodynka, the massacre of peaceful protesters by the Imperial Guard in 1905, and anti-Semitic pogroms.